Multiple buildings, including a high-rise residential tower, have collapsed killing at least 14 and injuring hundreds after a 6.4 magnitude quake struck southern Taiwan. Over 220 have been saved as emergency teams continue to scour through the rubble. 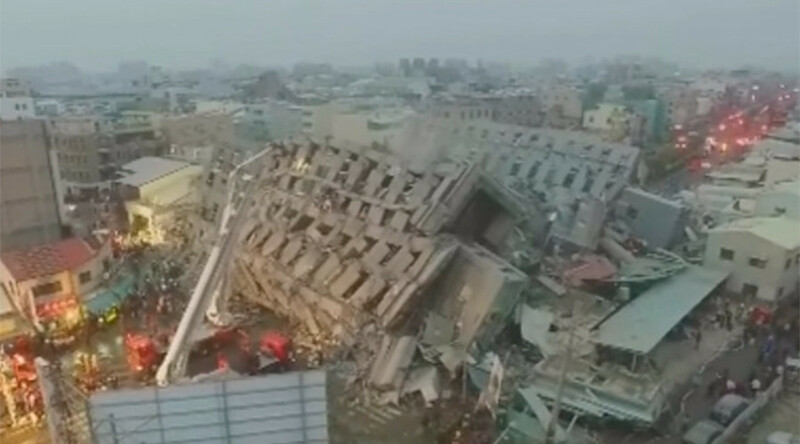 The emergency response center has confirmed that at least 14 people were killed at the site of the collapsed 17-story building in Tainan, including a 10-day-old infant, a 55-year-old woman and a 50-year-old man. In total at least seven buildings have collapsed as a result of the earthquake. "Four buildings have collapsed in Tainan City area. Search and rescue is underway and no casualties have been reported at this moment," Lin Kuan-cheng, spokesman for the National Fire Agency, told AFP. The 17-floor apartment building houses over 250 people and consists of at least 90 households, according to City Government Fire Bureau information officer Lee Po Min. At least 247 people have been rescued from that high-rise residential tower, the local fire brigade told Reuters. At least 477 people were injured in Tainan as a result of the earthquake, AP reports. More than 2,000 people are involved in rescue operations and at least 840 soldiers have been mobilized to help the efforts, Taiwan’s defence ministry said. "@taispy: Earthquake we just had in Taiwan is no joke. Hope all are safe in Tainan: https://t.co/CYzGmvSzDVpic.twitter.com/9nYkn9ZWHY"
Dozens have been rescued from a market and a seven-floor building that was badly damaged, the Central News Agency reported. The agency added that a bank building damaged in the quake caused no injuries. Formosa TV said 37 people were rescued from another seven-story property. The epicenter of the quake was located at a shallow depth of 6.2 miles (10 km), some 19 miles (31 km) east-southeast of Tainan, the USGS said. The quake was initially reported as a magnitude 6.7. Immediately following the quake, 168,000 households were left without power in Tainan. About 900 households are still left without electricity, according to Taipower. The quake has been described as "enormous" and "a big one" on social media.